This thermoregulator can be used in several ways. 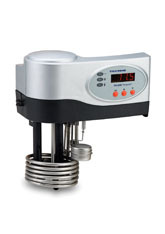 (1) Stand-alone waterbath temperature controller with precision accuracy and stirring action. (2) Pump for recirculating chilled liquid produced in an external chiller allowing sub-ambient water bath temperature. (3) Pump for providing temperature control to an external system or device. (4) A combination of using externally chilled liquid and providing temperature control to an external system. For additional information, please see Application notes under "Downloads".